"The Day the Earth Stood Still". Gort came to Earth in a spaceship as the robot bodyguard of Klaatu, an alien who is on a mission of peace. Gort can evaporate anything he targets with his laser-like vision. In the movie "The Day the Earth Stood Still, Gort is a large robot that appears to be constructed from a single piece of bendable metal. Actor Lock Martin was actually inside the suit for most of the filming. During the movie he wore a thick foam rubber suit that was designed and built by Addison Hehr. Two Gort suits were created, shown alternately from the front or back so that the robot could appear seamless depending on the camera angle. 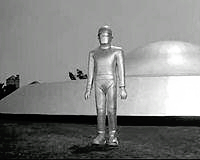 A fiberglass Gort was used for close-ups such as when he fired his laser beam weapon or when the scene did not call for him to move. In 2006, Gort was inducted into the Robot Hall of Fame. Here is original trailer for the film "Forbidden Planet"
Television, Newspapers and Magazine Articles.